Hello everyone!! Brenda here with you on this Monday morning!! I hope your week is off to a great start!! 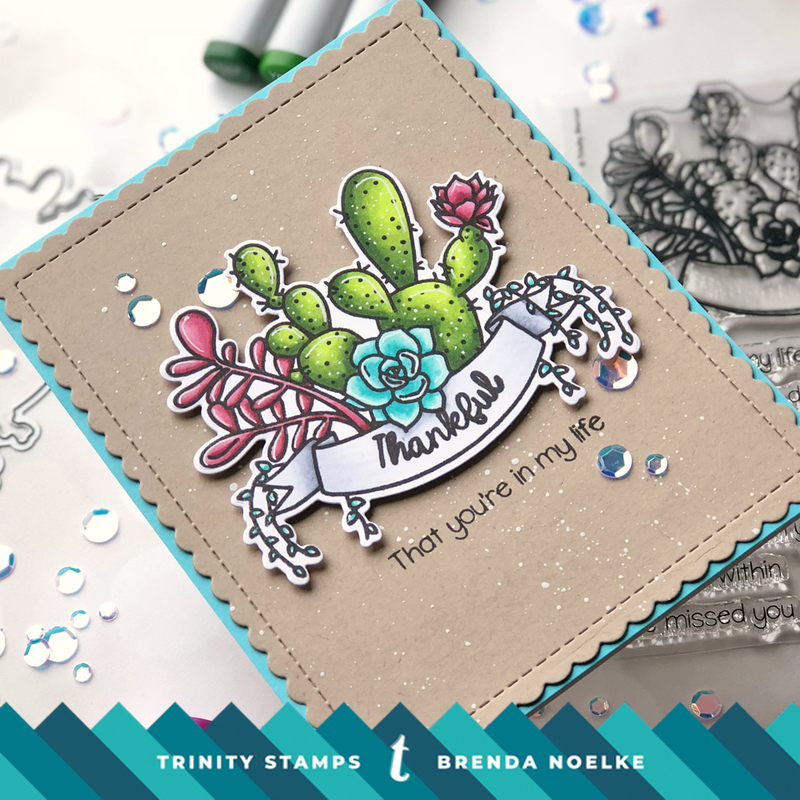 I have a card to share with you today that uses the Succulent Banner stamp set and Coordinating Die. Even though this set is one of the earliest sets released, I had not had a chance to ink it up yet!! I just love the succulents and how easy it is to customize the sentiment to say exactly what you want to convey! I began by stamping the Succulent Banner stamp onto white cardstock with Momento Tuxedo Black Ink. After coloring it with Copic markers, the image was die-cut with the Coordinating Die. I die-cut a scalloped rectangle for my background and splattered it with some diluted white paint. After the paint was dry, the remainder of the sentiment was stamped directly onto the background panel. The succulent image was popped up with foam adhesive for added dimension. I added some white accents to the succulents with a white gel pen. Lastly, a splash of Soapy Bubbles Clear Iridescent Sequin-Like Confetti (I LOVE that these are sequins without the holes) was the perfect finishing touch!! That’s it for me today!! I’ll see you on Thursday for my normal, scheduled post! !